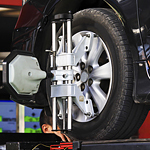 What is a Vehicle Tire Alignment Service? The vehicle tire alignment service corrects issues with the steering components in the front-end of your vehicle. If you neglect this service, you could be paying more for costly repairs in the near future. It only takes driving into one pothole or hitting one curb before the front-end alignment in your vehicle fails. The way you can tell trouble is in the near future, the vehicle is harder to keep within the lane lines and pulls to the side each time to hit the brakes. The longer between vehicle alignment services, the more the tire tread could be wearing on the sides as opposed to evenly down the middle. The wearing of the tread in that location could increase the chances of a tire blowout on the highway. Schedule a vehicle alignment service with Nelson Kia so we can keep a closer eye on all the treads for signs of failure.